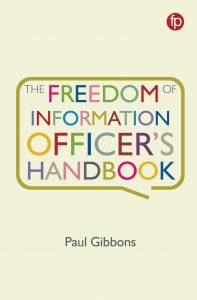 FOIMan brings you the opportunity to win a copy of Matt Burgess’s new book Freedom of Information: A Practical Guide for UK Journalists. 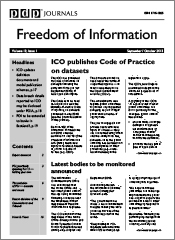 In October, journalist Matt Burgess and myself will be running a Masterclass for users of FOI, particularly aimed at journalists, but also useful for campaigners or anyone else who wants to use FOI to hold their local council, health body, school, or government department to account. 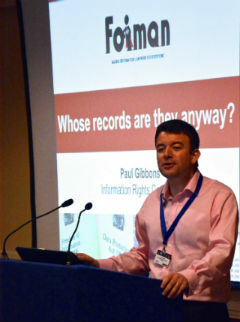 There are still places available, so remember to book your place if you want to learn how to make best use of the right to know. To mark our collaboration, here’s a first for the FOIMan site – a competition with a PRIZE!!! 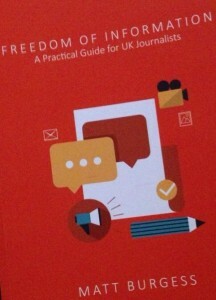 Matt has kindly donated a copy of his new book Freedom of Information: A Practical Guide for UK Journalists, which one reader of the FOIMan blog can win. For the opportunity to win this copy of Matt’s critically acclaimed book, all you need to do is complete and submit the form below, including answering a simple question about the UK FOI Act, by 18.00 UK time on 18 September 2015. The winner will be drawn at random from all correct entries. The book will be posted to the winner (I will contact you by email and ask for your address if you win) as soon as possible after the closing date and no later than 16 October 2015. By submitting your entry you are indicating your agreement to these terms and conditions. The winner will be the first correct entry drawn from all entries received by 18.00 UK time on 18 September 2015. No purchase of FOIMan services is necessary. Entrants are responsible for the cost of their connection to the Competition web page via the Internet and the cost of sending their entry via email. FOIMan does not guarantee continuous, uninterrupted or secure access to the Competition web page or website. No responsibility can be accepted for entries that are lost in transit. Competition only open to UK residents. The winner’s name will be made available on request. I will only use your email address to contact you with details of my courses and services if you tick to say you are content for this to happen. More details of how your contact details will be used can be found on the Privacy & Cookies page. If you choose to receive email communications from me, I will use your answer in the “Are you a…” field to ensure that you receive details that are most relevant to you. I will also anonymise and retain all the answers in this field to better understand who is reading this blog and website so that I can ensure it remains relevant and useful for those visiting it. This competition is being run by P. Gibbons, 21 Crampton Road, London SE20 7AR.